This past Saturday, I took Foster over to Fenridge Farm to cross country school, the first time since our dismal outing at the Fork last fall. With the wonderful support of 2 vets, a very patient and supportive friend (thanks Ali! ), and hock injection-ulcer treatment- hind wedges- chiro session- muscle relaxers (who knows which one finally worked? ), Foster is getting back to normal and we have the green light to start pushing for more serious work. 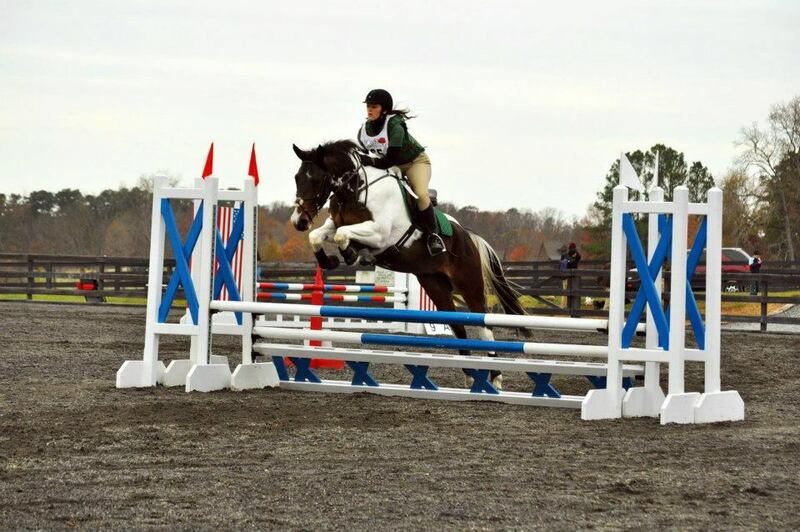 Fenridge was hosting a dressage show that day and so I decided to throw us in the deep end and see what happens with an eventing test, Beginner Novice A. It might have gone a bit smoother if I hadn’t missed the exit and given myself the shortest warm up ever! The rider before me started her test about 2 minutes after we arrived at the warm up ring. A quick trot and canter in both directions and we were up! However, I really can’t complain about our test. Foster is still getting strength back in his left hock, which means that our right lead canter is still a little shaky and he was a very good boy for picking it up for me, even if he made sure to complain about it for the rest of the movement. Besides the 5’s that resulted from this, the rest of the test went as well as could be expected after our short warmup (and not wearing spurs, which Foster desperately needs!). We left the arena laughing it off, and still got a nice little red ribbon to show for our efforts. I’m always interested to hear what this particular judge, Jan Jacobsen, has to say, as I feel like she is a fair judge who doesn’t throw around extra points and normally gives us great feedback to do homework with later. This time being no different, and Foster and I will be working on strengthening that hock so I can ask for more hind end engagement. After the test Ali and I made our way out to the cross country course. We tested the footing, which was surprisingly good considering the rip roaring thunderstorm we had gotten the night before. Some lunging to let Foster get the bucks out, and we were up. It’s silly, but in dressage I feel like a rockstar, showjumping I feel somewhat competent, but I felt like a real weenie sitting out there on the hill in my eventing vest after so long. And poor Foster could tell I was sitting up there worried to death, and tense as a compressed coil, waiting for him to take off with me. We warmed up for about 10 minutes and things got worse and worse and worse. Finally we stopped and took things back to a level where I could get my confidence back- trotting and canter over a pole on the ground. Keep in mind that a couple weeks before we were showjumping 3’3″. A pole- that’s what I had to go back to. When I realized that Foster was not going to take off with me, we went back to the X, and then a vertical, and I had my happy huntery horse back with me. Why? Because I breathed. I let go, and relaxed. Once I began trusting him again he was happy to do the job I asked him. With Ali coaching us we went over a couple small cross country fences, and when he kept the same consistent pace, we were both over the moon. As much as I would like to end this post by saying we were rocking out Novice and Training level fences, it would be a lie. But doing even those little fences with a happy relaxed attitude was exactly what I needed. And ending on a positive note is more important than proving to ourselves that we could do more. Maybe next time. As for now, I’m super proud of Foster and excited that we have something to look forward to next time. Cross country is definitely scary! But when you have the right horse (which I *think* I finally do!) it can be such an adrenaline rush! Here’s hoping we are both able to build our confidence up and move up a level this year!